Throughout the site there are a lot of discussions or posts about new types of retail going into particular buildings. Between all of the new construction and the explosion of bank branches, there is a lot to discuss. I thought it might be nice to have a single place where people could ask questions about particular sites or post knowledge they may have. As an example, someone posted HERE that they think a Gold's gym is going into the ground floor at the Grand Madison. That seems hard to believe as I would imagine the rent at that location has got to be pretty high and I would also imagine that the Grand Madison itself has a gym already so they won't get any of the residents to be members. What I find interesting is that as I walk around and look at the dozens of new developments, the vast majority have empty ground level retail. Is this because the developers are looking for rents that are too high? What kind of impact does this have on the building's buget? I assume the lack of rent translates into higher common charges for the residents of the building. 240 Park Ave S - ? Can anyone help fill out this list or name others? I would have expected that many of these places would put banks as they are great tenants (low traffic, great credit). I have heard rumors that a restaurant was going into Urban Glass House but nothing has happened yet. What is interesting is that the Hudson Square area is pretty much dead from a retail perspective and none of these new developments have retail tenants. Shocking that Duane Reade, a bank or Starbucks hasn't jumped on one of these leases. I thought 15 CPW was getting a Best Buy. It's no secret that the world of brokering Manhattan retail leases is, well, secretive. While some firms publish reports with price-per-square-foot figures for various submarkets, closed deals do not need to be publicly recorded, and there's no comprehensive database like there are in the office leasing and residential and commercial sales markets. Still, this month -- as Manhattan brokers head to Las Vegas for the annual International Council of Shopping Centers global retail convention -- The Real Deal attempts to shed some light on this otherwise-murky sector of the market by ranking the city's top retail firms. The ranking, which was compiled by collecting data from the firms, offers a unique glimpse into what is widely regarded as one of the real estate industry's least transparent sectors. 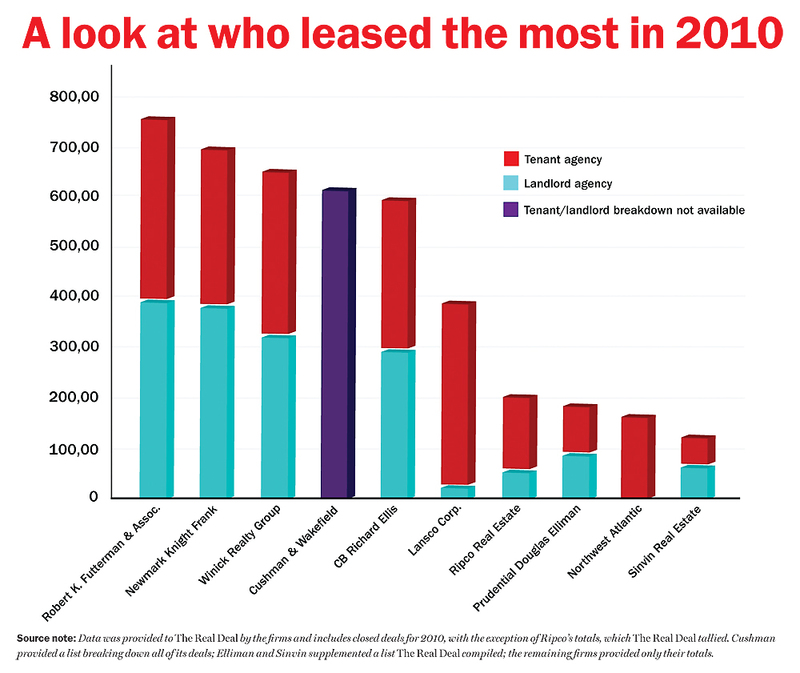 It looked at the total square feet leased last year in Manhattan (for both tenants and landlords), as well as the number of deals completed and the number of brokers at each firm (scroll down or click here to view the chart). The results place the independent Robert K. Futterman & Associates in the top spot, with the greatest amount of space leased in Manhattan in 2010, brokering a total of 133 deals for a combined 746,542 square feet. RKF also had the second-highest number of retail brokers, with 35. Right behind RKF was the much larger commercial services company Newmark Knight Frank, which did 214 deals for a total of just under 700,000 square feet. Although part of a much larger company with thousands of employees, here in Manhattan, Newmark has only 32 retail brokers. Those two firms were followed by the independent Winick Realty Group, with about 660,000 square feet; Cushman & Wakefield, with just over 600,000 square feet; and the largest commercial services firm in the world, CB Richard Ellis, with roughly 593,000 square feet. While three of the top five firms are divisions of global brokerages, the majority of the 10 companies The Real Deal ranked (all of which leased more than 100,000 square feet in Manhattan last year) are local players. They include Lansco Corp., Ripco Real Estate and Prudential Douglas Elliman, as well as smaller firms like Sinvin Real Estate and Northwest Atlantic. Robert Futterman, chairman and CEO of his firm, said it's deep knowledge in the local market, not a global reach, that was key to landing clients. "All of the bells and whistles of an international presence are only as good as the brokers in the market," he said, although his firm, too, is expanding, opening its sixth office last month, this one in Miami. The ranking is based on self-reported figures from the firms. For several firms, such as Cushman and Prudential Douglas Elliman, nearly all the lease deals were supplied to back up the numbers. Most firms, however, declined to provide comprehensive data. The retail leasing world in Manhattan is led by a small coterie of brokers, many of whom have been in the business for decades. While Futterman and Jeff Winick have firms carrying their own names, others are as well known in the industry as independent players or leaders of influential teams. One veteran broker, Bradley Mendelson, an executive vice president of Cushman, for example, represented the retail condo owned by Carlyle Group, Kushner Companies and Crown Acquisition at 666 Fifth Avenue in Manhattan's biggest lease deal last year. The Japanese retailer Uniqlo -- represented by Lansco's Yair Staav, Christine Emery and Roger Eulau -- leased 90,000 square feet at the site, in a deal valued at $300 million. Another longtime retail broker, Jeffrey Roseman, along with his team at Newmark, represented landlords for the firm's two largest deals, which were each about 26,000 square feet. In the first, Roseman represented SL Green Realty's 521 Fifth Avenue, which leased to Urban Outfitters. In the other deal, Roseman represented the co-op building at 949 Third Avenue for a deal with drugstore Duane Reade, which was represented by Winick of Winick Realty Group. Meanwhile, Ariel Schuster, along with Futterman and others at RKF, represented the landlords in the firm's two largest deals last year: Fairway Market, representing itself, signed for 45,263 square feet at 240 East 86th Street; and Whole Foods, represented by Chase Welles and Jacqueline Klinger at Northwest Atlantic, signed for 36,003 square feet at 250 East 57th Street in Midtown. Brokers noted that the square footage of a deal tells only part of the story. For example, the deal sunglasses chain Oakley signed last year for about $1,325 per square foot, taking 1,815 square feet at 1515 Broadway in Times Square, could be worth more than a drugstore deal 10 times the size on Second Avenue in the 70s, where rents are about $130 per square foot. While the mega-deals and high-fashion leases attract the most attention, the downturn forced brokers to shift gears. Faith Hope Consolo, chairman of the retail leasing and sales division for Elliman, was candid about the difficulty in completing deals. Pocketbook-sensitive shoppers led more low-priced retailers to enter the market as the economy soured over the past few years, said Consolo, one of the dominant personalities in the business. Her team of about a dozen agents at Elliman inked deals last year with discount retailers such as Bolton's, while also doing deals for trendier stores such as the clothing boutique Realm in Soho. "I believe I am known for the luxury market, and I don't do grocery stores," she said. "[But] I can change with the market, and if discount is in, we go with discount." Representatives from most of the companies were skeptical of the figures released by others. Consolo noted, "This is self-reporting, and everyone is going to question what everyone else did." Regardless, the top retail firms could soon have a run for their money. That's because the retail brokerage world may be heading for its largest transformation in over a decade, as new players try to enter the game. In January, Massey Knakal Realty Services, the hardscrabble mid-market commercial brokerage firm, announced it would begin retail leasing. While no one expects the firm to break the top tier of retail brokerages in the near term, they have already begun to snag deals from Winick, and have even poached their division head, Benjamin Fox, from that firm. Meanwhile, major commercial firms like Jones Lang LaSalle and Colliers International -- neither of whom made The Real Deal's list -- are looking to hire teams to establish or grow their retail presence in New York City. In addition to JLL and Colliers, Cassidy Turley, with offices throughout the United States, and international firm Studley were notably absent from the list. Cassidy Turley has a minimal presence in the city and Studley has no retail presence here, despite the fact that they are significant players in the office-market universe. Some brokers believe the addition of new firms could mean a dramatic shakeup in New York's retail brokerage landscape in the coming months. JLL is expected to hire a big team this year, potentially poaching brokers from other top firms. In addition, an insider at Colliers said the company, which has only three retail brokers in Manhattan, is also looking to hire. The fact that more global companies want to get in on the action only underscores how much money can be made in New York City retail deals these days. The commission on the Uniqlo deal was estimated to be about $6 million total for all of the brokers and firms involved, sources said. However, there are barriers for companies that want to start from scratch. Many believe that JLL, for example, would need to poach a large, well-established team to get any attention. Also, similar to the investment sales market, there are few high-profile retail leasing agents -- only about a half-dozen by one count. Sources said JLL approached Futterman to buy his company, but he declined. Futterman would not comment on specific offers, only saying he gets offers all the time and isn't interested in selling. But at the time, most other leading office leasing firms, like Cross & Brown and Helmsley-Spear, considered retail an afterthought. Then, in the late 1990s, two new trends got brokers more interested in retail. First, national chain stores took a new look at street-level retail, and second, developers began ramping up construction of retail space in residential and commercial buildings in the city. Brokers saw a new source of revenue. "National retailers found the streets are a place they could increase their bottom line," Futterman, formerly of Garrick-Aug, said. He opened his own shop in 1998. The next year, Cushman began ramping up its retail team after buying the large British retail firm Healey & Baker. Following that acquisition, which did not impact New York leasing but inspired Cushman to enter the fray locally, it grew from one retail broker in 1999 to 29 today. Then, in 2000, the influential firm New Spectrum Realty Services, where Roseman was a broker, merged with Newmark to form Newmark Knight Frank Retail, where Roseman continues doing significant deals such as the Oakley deal in Times Square, where he represented landlord SL Green Realty last fall (note: correction appended). Of course, the competition has increased with the entry of the larger companies to the market. Gary Dana, the executive vice president at Prudential Douglas Elliman's Dana Commercial Group, who has been at the firm since 1978, recalled how much easier it once was to get a deal done on Madison Avenue. "There were only a few brokers working Madison [Avenue]," said Dana, referring to the 1970s. "Now there are hundreds fighting [for deals]." As with much of the real estate market, brokers and firms find a niche and capitalize on it. "I think it is safe to say the most successful guys specialize" in several parts of the market, Timothy King, principal with CPEX Real Estate, which focuses on commercial sales and leasing in Brooklyn, said. While the larger firms have a broad practice, individual brokers and teams tend to focus on particular categories -- whether it be a type of retail, a geographic area or both. • Firms like RKF and Winick, which have cultivated strong relationships with developers, winning business to lease up new construction projects. For example, RKF has handled projects like 15 Little West 12th Street in the Meatpacking District for Taconic Investment Partners, where Arhaus Furniture leased 32,000 square feet last year, and is currently marketing 11 Times Square for SJP Properties. • Newmark, Cushman and CBRE have a strong leg up in landlord-side representation, a carryover from their dominant office and leasing representation in the city. But they compete with each other for tenant representation. • Ripco, headed by Peter Ripka, represents the William Gottlieb estate, giving it a pool of buildings to lease up in Greenwich Village. On the tenant side, Ripco specializes in large firms like pet store PETCO and discount retailer T.J. Maxx. • Northwest Atlantic tends to concentrate on big tenants as well. The company's top broker, Chase Welles, represents tenants such as Whole Foods and Staples, and like Ripco, does a lot of big-box business outside Manhattan. • Other boutique firms, such as Sinvin, and smaller firms that did not make the top-10 list, such as New York Commercial Real Estate Services, or NYCRS, focus on geographic regions. Sinvin principal Michael Glanzberg said the company has carved out a niche in the Lower East Side and Soho, while NYCRS focuses primarily on tenant representation south of 14th Street. Ken Brandman, president of NYCRS, said his firm is pushing to get more landlord-side work. Cushman's Mendelson -- who was a cofounder and president of Garrick-Aug and who later worked at Edward S. Gordon Company and at CBRE -- predicted that smaller firms will have trouble in the coming years. "I would think the small retail specialist is not the best business model," Mendelson said. "Retail does not pay like office. In order to make serious money you need the big deals." Others say the pie is growing as the economy improves this year. "The market will show more activity, by 10 to 15 percent," said Northwest Atlantic's Welles. But he did not expect big changes, even with a few more active firms. "I don't think it has a big impact on the market at all. Brokers will do their jobs and space will get leased at the same rate. Everyone will maybe have to hustle a little bit more," Welles said. That's an interesting article. As an owner of retail spaces in Manhattan I always struggle whether to use a broker and never know which brokers are reliable. Too often I find brokers sit on a retail space doing little to market it. It seams most of their goal is to put up a sign, put it on the leading web-sites and sit and wait for calls. I'm curious if there are other retail owners on here. If so, how do you go about renting retail? Which broker, if any, do you recommend? What are your first few actions when you know you will be having a space available. I'm Dionne and co-own a NY care home. We get offers constantly for our land but have never considered selling up! I know it's not retail space, but all space in such a busy place is sold at a premium. Thanks for all the information, NoyokA! Last edited by Didey; November 1st, 2011 at 05:31 AM. Good retail article. Similar in your position in having a portfolio of retail spaces around NYC. I usually don't give brokers exclusives because as you mentioned, they don't push our space enough. Most of these retail brokers are interested in marketing their signs & company on our properties. What we do is we usually work with the retail brokerages on one-off deals since some of them represent tenants exclusively (ie. Winick for Duane Reade). Some spaces we market to within our own current retail clients if they're looking for new markets to expand within. Each case is very VERY different. "Mall" has been a four-letter word in the Manhattan retail world for some time now. Despite that, Manhattan property owners have begun to -- or are planning to -- rehab and build a historic amount of large-scale retail over the next few years. More than 635,000 square feet of retail taking shape at the World Trade Center. Not long time ago a mall opened in Harlem on 116 close to the East River with little success I think.